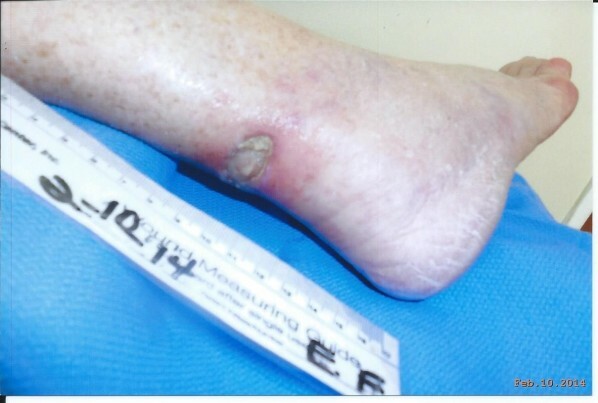 To heal post-surgical wound of Basal cell Carcinoma on right post distal leg above heel and on Achilles tendon. First saw patient on 2/1/2014. 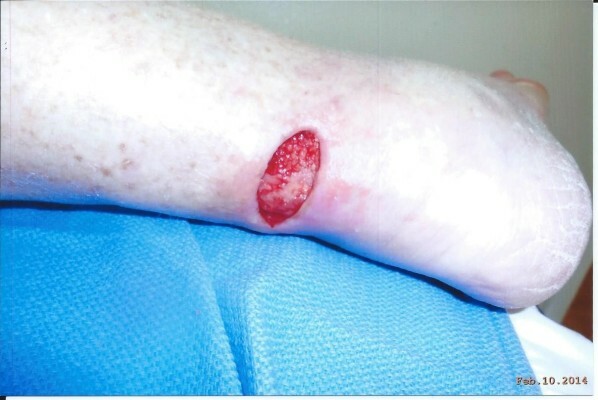 Debrided wound and took “before” and “after photos (see photo below). 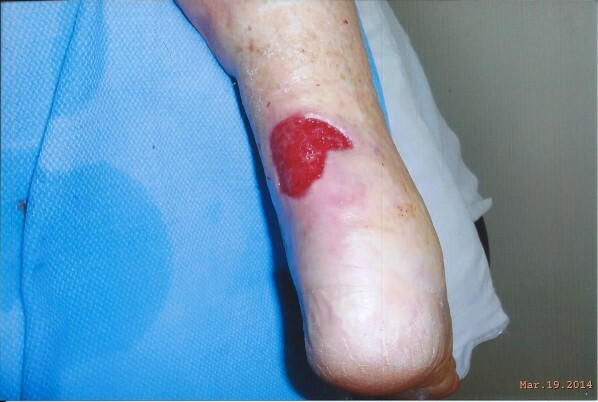 Removed non-viable tissue, most of which was the artificial skin that had adhered to the surface and was very thick in the corner of the wound. Used Santyl and Mupurocin and Covered with 4’ conform and Co-wrap for compression. Patient was requested to be seen initially 3 times a week. Patient returned on 2/12/2014 and I was not satisfied with what I saw. I then decided to switch to the Anasept Gel which I then started using. On 2/19/2014 I took another photo showing that the wound had enlarged to 3.6 x 2.1, however, looking and doing much better (see photo below). Much of the eschar had gone and the beginning of healthy granulation. I contribute this to the regime of now using the Anasept Gel. It is promoting healing in a quicker fashion. Patient continued 3 times weekly though mid-March. She did have a setback as we did do a culture and the patient had Strep but again using the Anasept provided an additional safeguard while on the oral antibiotics as well. On March 19, 2014 another photo was taken and redder granulation tissue was evident and wound coming to surface level (see photo below). It now measures 3.6 x 2.9 and the size is not as important as the actual healing of the wound. Patient is finally seeing the results as well and is so please. She had her share of ups and downs with the wound so for her to see it looking healthy is a bonus. I continued the debriding, Anasept Gel and covering with Telfa and 4’ conform wrap. On March 26, 2014, another photo was taken and the wound is looking terrific with measurements now of 3.6 x 2.0 (see photo below) We are now seeing reduction along with healing. I saw an immediate difference once I began using Anasept Gel. I feel it gave me a more aggressive approach and promoted excellent wound healing to date. I will continue until wound closure. 2/19/2014 photo shows that the wound had enlarged to 3.6 x 2.1,however, looking and doing much better.